Fodder is food for livestock, usually entire plants. In this case it’s for chickens. I grow the fodder in a hydroponic type environment so that I don’t need any type of soil medium. In reality I am growing sprouts, but the sprouts will close knit with each other and create a mat of roots and seeds. Some of the seeds don’t sprout and so they will ferment. 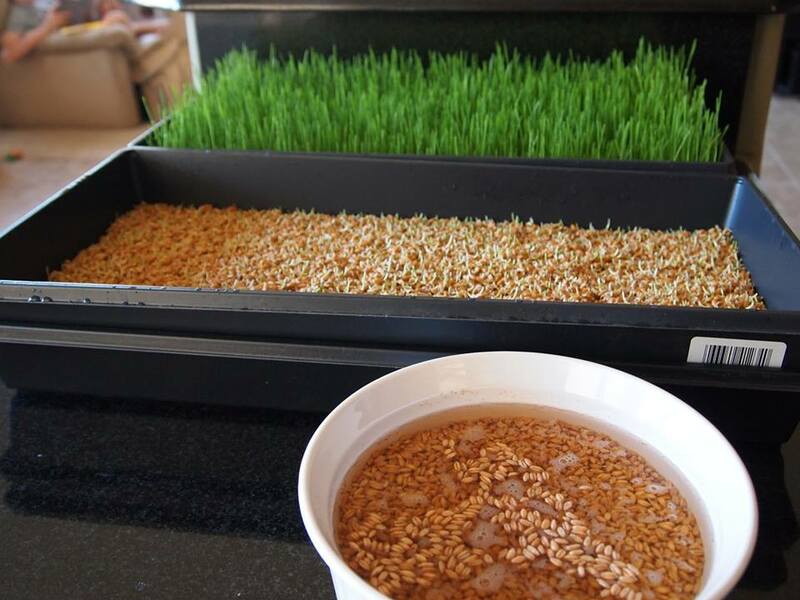 In the end what you have is wheat grass, fermented wheat seeds, and roots. The chickens will eat the whole thing and the entire process takes 6 days from grain to fodder. I grow enough for two days at a time so I start a new batch every two days. I begin by measuring out about 13-14 ounces of wheat. I have six chickens. This will supply two days worth of fodder. That doesn’t seem like a lot but remember the seeds will sprout and the final product is significantly heavier than the initial seeds. I’m not real strict about the measurement, what I do is actually fill up a red Solo cup just under the rim. 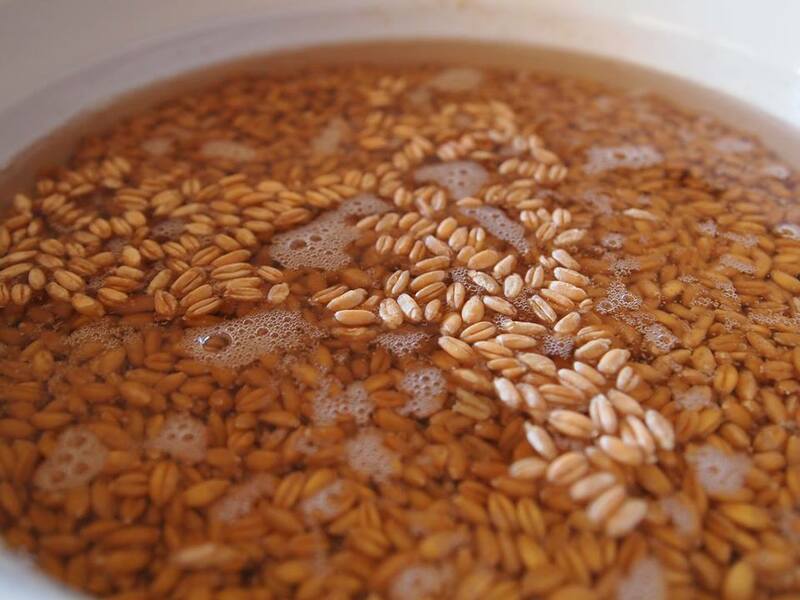 I then soak the grain overnight or for about 10 hours. I went to Home Depot and picked up some black plastic seed trays. I believe they are made by Jiffy and cost like… $1.58. I put the smallest drill bit that I had into my drill press and proceeded to poke holes every inch or so in the bottom of the first tray. The second tray was left intact. 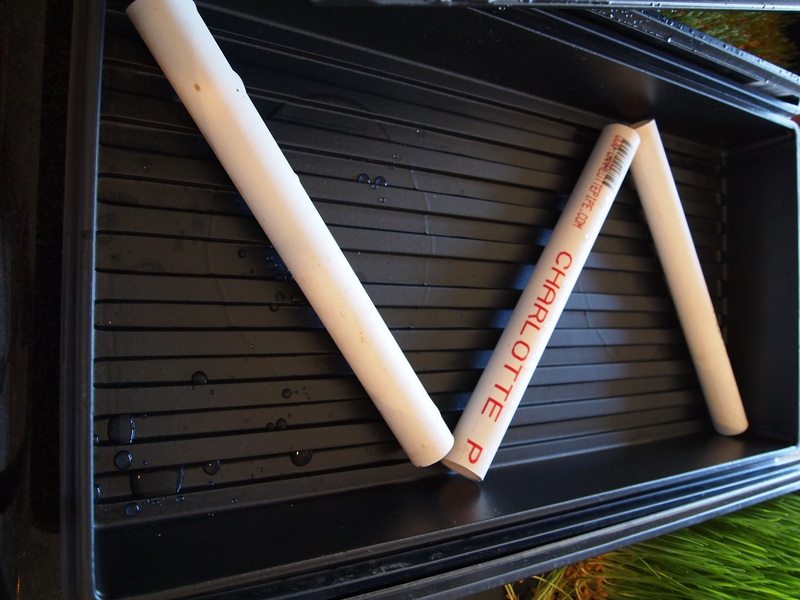 I place three pieces of PVC pipe (I used 1/2 inch because I had it). I cut the PVC to be a little long then turn it diagonal in the bottom of the tray (the one withOUT holes). The pieces fit end to end and they fill up the entire tray. Leaving them longer and placing them diagonally keeps them from rolling. I dump my saturated seeds into the tray, preferably over the sink where they won’t make a huge mess. I work the tray up and down a few times to get most of the water to drain. I put the tray with the seeds on top of the one with the PVC and WHAMO you have a hydroponics seed sprouting set up! Simple. Here is what the different batches of fodder look like all lined up next to each other. Twice a day I remove the top tray and put it in the sink and spray it down pretty good. I keep spraying for about 30 seconds then let it drain and replace it. Once the sprouts are about 1 inch tall I go to once a day. This helps keep it from molding. Of course I live in a desert, so… I might have a little more leeway on this than other places in the world. We feed 1/4 of a tray to the chickens in the morning and 1/4 in the afternoon. We supplement with some organic scratch and some re-hydrated alfalfa. That’s it! Healthy, organic, nutritious… and cheap! Haven’t tried this yet…but I want to. I am just not sure how to go about it with the amount of animals we have. Good question. I think I’ve seen cows, goats, chickens, and pea chicks (?) on your blog. Just go ahead and plant a whole pasture of wheat grass, that might do the trick 😉 Actually we don’t get much sun in our tiny little backyard in winter so I’m thinking I’ll over seed with some wheat. Then the chickens can just work a little on that every day and if I keep trimming it I can just put the trimmings in their run. Makes sense to me!